We have taken a new MRI machine into operation from the beginning of 2017 and are now working with the Philips Achieva 1.5T dStream. This means that we have now a device which uses digital technology, providing us with maximum image quality. The MR signals are digitized right in the coil and transmitted to the image reconstructor through a fiber optic connection. Data loss and detriments to image quality can thus be reduced as far as possible; we achieve substantially clearer images than before. At the MRT Akademie we have a clear focus on patient comfort. This is why we have installed the “Philips Ambient Experience” solution and the “Philips InBore Solution”. 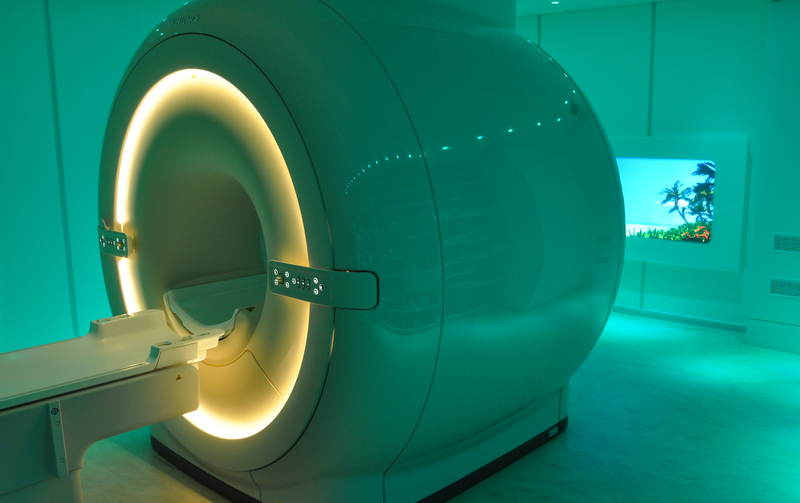 On a large monitor behind the MRI machine, which can be seen from the tunnel through a special mirror construction, you can choose to watch either nature films, animated films or your own videos. You listen to the music or soundtrack through a special headset, which at the same time reduces the noise level during the examination by up to 25 decibels. The MRI machine has a ring of light at the entrance to the tunnel which brightens the tube optically. The room can also be filled with coloured light to suit the film or according to your request. A posterior coil is integrated into the examination table. We can now carry out up to 60 percent of the examinations without an additional coil. This allows us to frequently perform faster, more comfortable examinations. The particularly thin tabletop provides more space in the tunnel. In many cases, there is a choice of whether the patient is examined head first or feet first. To ensure the best possible comfort for the patient, the machine provides a fresh air supply in five different strengths as well as adjustable interior lighting in the tube.